Your pillow is one of the most important items to help you get a restful and snore-free sleep. There are innumerable types of pillows in the market, but when you start talking about anti-snoring pillows, there are two that stand out in the field: the Nitetronic goodnite™ Anti-Snore Pillow and the Smart Nora pillow. I’ve tested each of these pillows and compared them here to give you my take on each pillow and which one I think is the winner. How Do These Smart Pillows Work? Both the Smart Nora and the Nitetronic pillow use the same technology and concept to prevent snoring. When the pillow detects snoring sounds, each pillow gently inflates by 2-3 inches for a short period. This change in pillow position causes the sleeper’s head to adjust slightly upward and then lower while the pillow deflates. By changing head position, both pillows give the snorer a breathing reset, which eliminates snoring for 5 to 30 minutes. This inflation and deflation process repeats itself throughout the night as the pillow detects snoring sounds. The inflation in each pillow is gentle enough not to wake the snoring sleeper. Each pillow uses a different method to detect the snoring sounds. The Smart Nora uses a small device, called a Pebble, that can be mounted on your headboard, wall, or sit on your nightstand. It is wireless but does require charging for power. The Nitetronic pillow uses sensors that listen for snoring. These sensors are built into the custom pillow. Both pillows have advantages and disadvantages to the type of sound sensor they use. The method these two pillows use for inflation is also different. The Smart Nora uses the Air Tube, which is a pillow insert that works in conjunction with your existing pillow. Getting to use your current favorite pillow, instead of adjusting to a new pillow, is a big bonus to the Smart Nora pillow. The Nitetronic is a custom inflatable pillow, with sensors built in. It is a hard pillow, which at first is a little uncomfortable and it can take you some time to adjust to the feel of it. 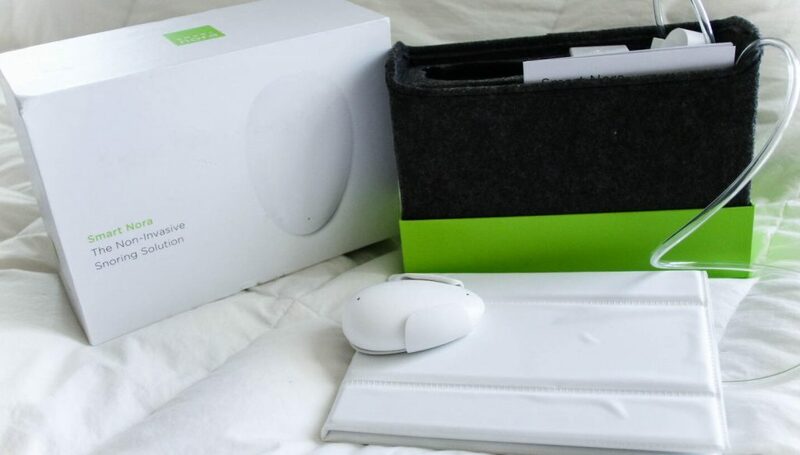 Unlike the Smart Nora, the Nitetronic pillow connects to two apps (Nitelink and Nitelink2) via Bluetooth to help track your snoring levels and head position. The Nitetronic goodnite™ Anti-Snore Pillow was very easy to use and had a simple and straightforward setup process. You plug the pillow into the closest outlet and connect the pillow to the two apps via Bluetooth. The two companion apps (Nitelink and Nitelink2) are useful for tracking your head position on the pillow and capturing the sounds of your snoring. If you need to use additional anti-snoring devices while sleeping you can use the apps to see if they are effective in reducing your snoring. Ordering the pillow is very easy, and with the SnoringHQ discount, costs $220. The Nitetronic is a hard pillow, so it does take some time to get used to sleeping on it, particularly if you are used to sleeping on a softer pillow. Unlike the Smart Nora pillow, there is no delay on the inflation, so it might inflate when you are talking to your bed partner right before falling asleep. You can adjust the goonite™ pillow’s sensitivity settings using the Nitelink2 smartphone app. The pillow is designed to respond when three conditions are met: snoring detection, snoring vibration and head position. It shouldn’t react to any surrounding sound like fans or air conditioners. The Smart Nora Pillow was an easy to use pillow that put a stop to my snoring with little effort on my part. It was relatively easy to set up, although it did take me a couple of nights to find the right sensitivity setting. The Smart Nora uses an Air Tube, which is an inflatable pad that goes underneath your personal pillow. I did find that if the Air Tube is not positioned precisely underneath your pillow, it will not reposition your head properly when it inflates. The first couple of nights the pillow did inflate based on extraneous sounds in the room. Because the pillow picked up other noises in the night, if you are a quiet snorer, this pillow might not be the best solution for you because the pillow is likely to be activated by other noises in the room. Unlike the Nitetronic, the Smart Nora has the Pebble. The Pebble has a microphone built into it to detect snoring and communicates with the Air Tube to inflate when triggered. I found the Pebble to be one more item to keep track of among my electronics that I must keep charged. It needs to be charged every 5-7 days, which I found to be a little too frequent. The Smart Nora has a delayed start to its sound detection, allowing you to talk to your spouse (or yourself!) before you fall asleep without triggering the inflation. The Smart Nora regular cost is $300. Often, they run promotions and as of May 25th, 2017 the price was $259. You do need to test the pillow 7 to 14 days but it is returnable up to 30 days if it does not work out for you. Nora has a 30-day, 100% money back guarantee policy. They even pay for the return shipping label. After extensive testing of both anti-snoring pillows, we’ve determined the Nitetronic goodnite™ Anti-Snore Pillow to be the clear winner. A combination of price, warranty and features clearly indicates the Nitetronic provides the best value for your money. As of May 26, 2017, the Nitetronic is less expensive than the Smart Nora. We found the technology for the Nitetronic goodnite™ much easier to understand and use. The inflation on Nitetronic is also quieter. Depending on how often you snore at night, quieter inflation could mean the difference between a restful night of sleep and one that is constantly interrupted. The ability to use the Nitetronic apps for iPhone or Android makes it more attractive to potential users also. The only downside to the Nitetronic is that it is not quite as comfortable as the Smart Nora. It took a few nights to adapt to it. The Smart Nora requires some set up of the base and continued charging of the Pebble. The Nitetronic only requires plugging the pillow into the closest outlet and connecting it to the companion apps via Bluetooth. The availability of the Nitelink and Nitelink2 apps for the iPhone and Android add a lot of value to the Nitetronic pillow. Both apps provide quality data on your sleeping patterns.